An SLA is made up of 3 parts, Conditions and Actions, and a Description Both the Conditions and Actions are plugins to Kylo and you can develop your own custom ones. To learn more view the Developer Guide below. This allows you to select a feed and define when you expect data to arrive for that feed in the form of a cron expression (i.e. Every day at 12pm). If Kylo doesnt get data for the feed by the specified time then it will be an SLA violation and Kylo will call the associated actions. Note: For help in writing cron expressions refer to the website http://cronmaker.com. Note: You can chain multiple conditions together. An SLA with multiple conditions will only fire its respective Actions if all the conditions are met. Kylo will send an email to a user or set of users. Details can be found here. Kylo will create a JIRA issue. All SLA’s require a name and description. These fields are auto populated based upon the users Conditions/Actions, however you are free to change this to whatever you like. All SLA’s are assessed the same schedule. This is defined in the kylo-services application.properties file, defaulting to every 5 minutes. 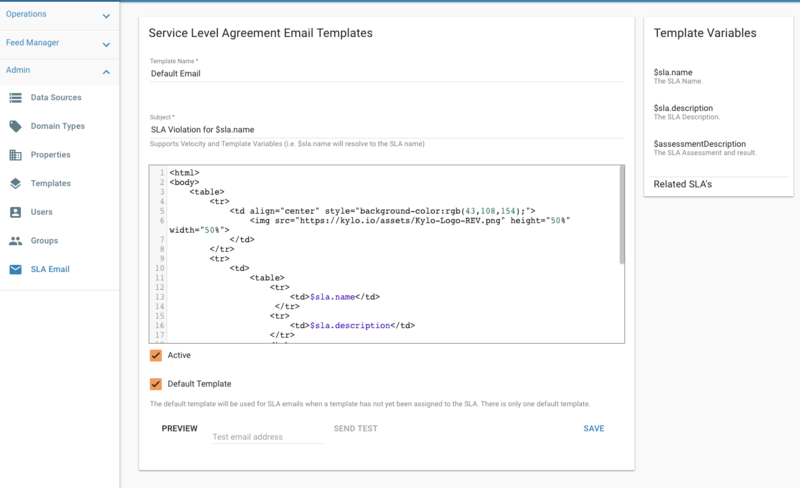 When an SLA is assessed, it will use/derive values that define the uniqueness of that assessment and determine if it is a new violation to generate an alert and email or not. For example the Feed Processing Deadline condition identifies the uniqueness by the feed, and the expected date. Kylo will assess the SLA and see if it passes/fails. If this failure is new it will create the new Alert and then call the SLA violation actions (i.e. email, jira, etc). If the failure already has an alert associated with it that is Unhandled it will not generate a new alert/violation. All assessments are persisted in Kylo’s metastore and can be queried from the SLA Assessments link, or from the SLA. Clicking into an assessment lets you see its details and why it failed/succeeded. 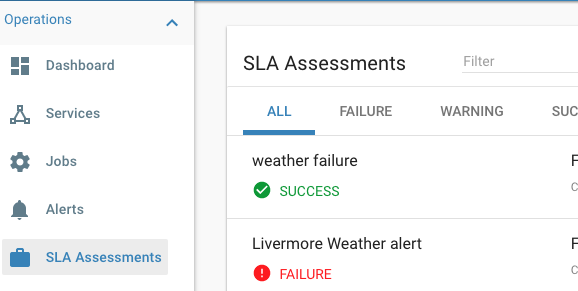 Each assessment also lets you navigate back to the actual SLA from the right panel. All SLA violations will generate an alert in Kylo. 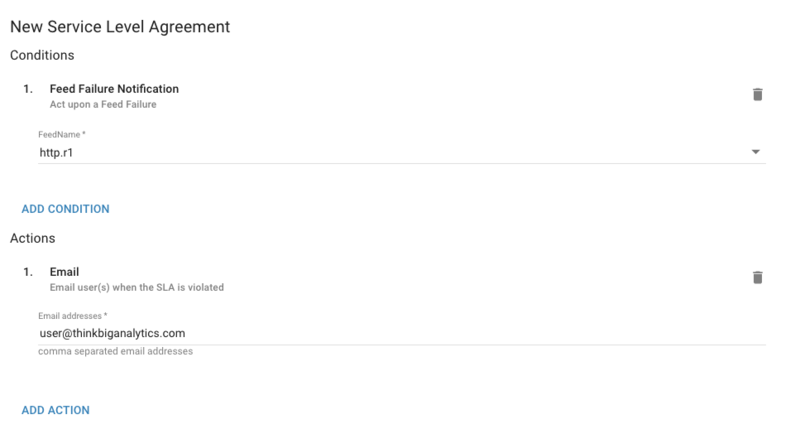 Alerts can be viewd under the Operations section and filtered to just show SLA Violation alerts. 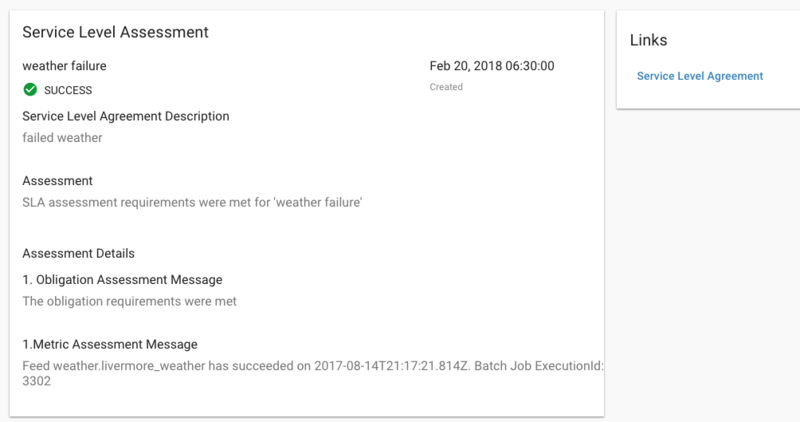 Clicking into an alert shows its detail and lets you navigate back to the assessment that generated this alert. As of Kylo 0.8.4.1 SLA email templates can be customized in Kylo using the Admin -> SLA Email. This lets you craft an email template. Assessment variables will be injected into the email. You can preview in the browser and also send a test email to verify the template prior to saving.